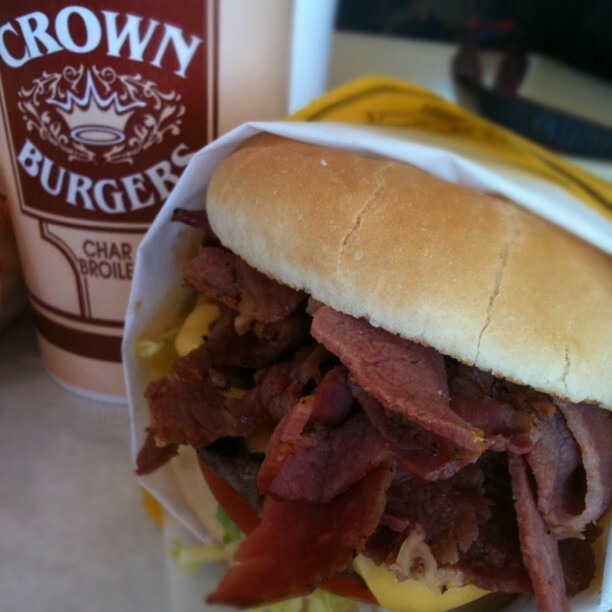 A snowboarding trip to Utah isn't complete without a stop at Crown Burgers. Their eponymous burger is a thing of beauty. After sitting on an open flame until charred in all the right places, it's topped with a slice of yellow American cheese, a half-pound of griddled pastrami, shredded lettuce, tomato, and fry sauce (mayo folded into ketchup). Served with French fries whose shape and thickness would be the result of a steak fry and a McDonald's fry having fry babies, I was tempted to order three more in case it took me another three years to get back to Salt Lake (and three days after returning home, I feel like a jackass that I didn't). Buen provecho. That thing will put you down.